The Past perfect progressive is a verb tense which is used to denote an action that has been in progress continuously up to the point of another action in the past. The Past perfect progressive tense shows action that has been in progress continuously up to the point of another action in the past. 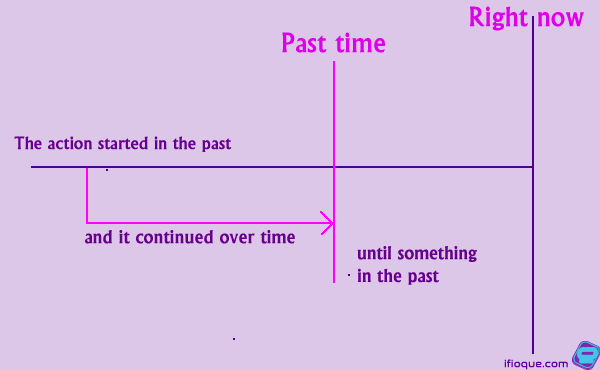 This tense is related to the present perfect progressiveOpens in new window; however, in the past perfect progressive, the duration does not continue until now because it stops before something else in the past. Fig1. If we draw a picture of this type of action, it looks like this. Basically, the past perfect progressive emphasizes the duration of action that was in progress before another action or time in the past. In other words, it shows that an action started before a time in the past and that the action continued until (or almost until) that time. Using the past perfect progressive before another action in the past is a good way to express the idea of cause and effect. Andy had been chatting online before he went to bed. Her skin was sunburned because she had been lying on the beach all day. Before the criminals were caught, the police had been hunting for them for six months. 1. Expression of Affirmative Statements with Past Perfect Progressive Tense: To make affirmative statement with past perfect progressive tense, the structure: subject + had been + ...ing form of verb is used. When Laurel eventually opened the door, Beatrice had been knocking for ten minutes. The children were exhausted because they had been dancing all through the party. We had been living in Memphis for 18 years before we moved to the suburb. 2. Expression of Negative Statements with Past Perfect Progressive Tense: To make negative statement with past perfect progressive tense, the structure: subject + had not been + ...ing form of verb is used. Laurel opened the door quite late because for five minutes Beatrice had not been knocking properly. The children were bored because they had not been dancing all through the party. We had not been living in Memphis for longer time before we moved to the suburb. 3. Expression of Interrogative Statements with Past Perfect Progressive Tense: To make interrogative statement with past perfect progressive tense, the structure: (interrogative word) + had + subject + been + ...ing form of verb is used. These kids looked so dirty, where had they been playing? How long had Lola been living in Memphis before she came to Durham city? Had Effiong been drinking before he arrived home? 4. Expression of Negative Interrogative Statements with Past Perfect Progressive Tense: To make negative interrogative statement with past perfect progressive tense, the structure: (interrogative word) + had not + subject + been + ...ing form of verb. However, the contraction form ‘hadn’t’ is used instead of ‘had not’. These kids looked so clean, hadn’t they been playing? hadn’t Lola been living in Memphis before she came to Durham city? Effiong looked so cool hadn’t he been drinking before he arrived home? We use past perfect progressive to make it clear that an action happened over time until something in the past. A lot of the time, it is preffered to use past perfect + a length of time to show this. Usually, both tenses are correct and they both mean the same thing. I had studied for three hours before the test. I had been studying for three hours before the test. Unfortunately, sometimes only one of these tenses is correct. A simple rule will be introduced here; it won’t tell you everything, but if you follow this rule, you won't have much to worry when trying to create correct sentences. Here is the Simple Rule! Geoffrey had been washing his car when it started to rain. Bryan had loved Lola since the day they met.